Sue is over the moon with her new vehicle – it is the first half-decent one she has ever had – and it was a bargain! She thanks everyone once again for their help – she will soon be in touch with everyone waiting for her to collect items, though it may take a little time as there is quite a backlog. She has been able to return to Pitlochry to finish trapping ferals there. A feral mum & kittens have turned up in Ladybank – they need to be trapped & sorted. This is all clashing with soft fruit season & the need to make more jam! Many thanks go to all who have donated fruit. 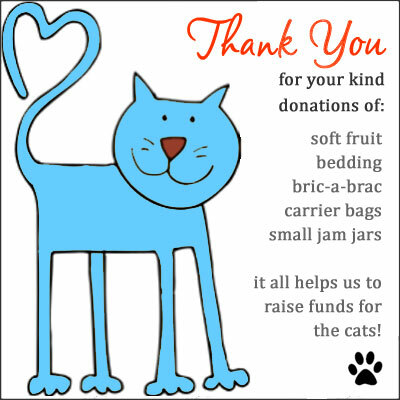 Thanks also to everyone who has donated cat food, bedding & bric-a-brac. As Whinnybank is full to the rafters we need as much food as we can get! !